Achieving more visitors is the primary target of every professional blogger. We know the primary source of traffic (organic traffic) to any website or blog is Search Engines. So to achieve more traffic to our blog we need to achieve better search rank in major search engines. Many professional bloggers (in Blogspot platform) are developing unique quality content and update their site regularly but fail to get a better search result. The traffic count they are getting is less than what they actually deserve. It is because of the reason default Blogspot template is not much search engine friendly. A small tweak can make blogger templates search engine friendly. Why Blogger Blog Posts Fail to Get Higher Rank in Search Engine Results Compared to WordPress? You must note that sometimes WordPress blogs outrank Blogger blogs in Google Search results even if both blogs have same PR, backlink count etc. It is because of the difference in arranging post title tag in both WordPress blogs and Blogspot sites. The most important part of a web page to get search engine attention is its title tag. According to Google webmaster guidelines, title tags of each page in your website should be unique. If this tag of your website or blog pages are similar, you are losing the search engine trust. So it is the duty of each webmaster or blogger to maintain a unique title tag for every page or blog post. Now let us check how blogger works. So if you have a long attractive title for a blog, that will repeat in every published post. It is known that only the first 62 characters in this tag are considered by Google and other major search engines. So we are losing the important places here with a nonrelevant [blog's] name. So we need to change the tag structure as shown below (With SEO plugins WordPress ensures Search Engine friendly post title tags). Now we have the advantage that search engines will see the post title first. To change the Blogspot headline structure we need to edit default blogger template and optimize it. To make Blogspot post heading SEO friendly by optimizing blogger template as we have discussed(shows blogger blog post headline before the blogger heading for every published post), follow the steps below. 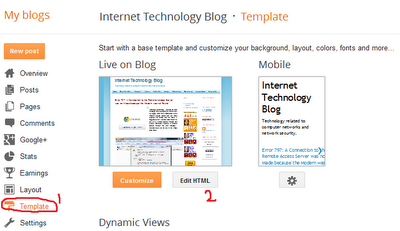 This simple Blogspot template edit will show blog post heading before blogger heading on every published post. By placing post headline before blogger headline on every post ensure more traffic to your blogs. Now onwards you understand the basic reason for the higher Search Rank position of WordPress sites compared to Blogger sites and learned how to rectify the issue. So here is the answer to the question if Blogspot sites or WordPress sites rank high in Google. However, to improve the income from your site, you should be careful in Google Adsense ads placement. Follow the link below to learn more about it. Showing post headline in front of Blogspot headline helps Search Engines to identify the difference between different posts in your site. Another step to improve the unique feature is to set up a custom domain name. To do this follow the steps provided in the link below. Great tips Siju. I'm going to implement it & will post the results. It will result a hike in traffic.Because, by using this tweak we can better utilize the precious space in the title tag. I was actually looking for a reason why wordpress is SEO friendly than blogger. After reading your article I understand the reason. Thank you brother now my blogger blog is also well optimized. Greetings i am new to this board i hope i will be able to help out & give something back here because i have learned allot myself. Thanks, I will use it also! Please make sure the Check-box before "Expand Widget Templates" is checked. Thanks, after swapping the order of blog and blog posts titles, I see a huge difference in traffic. Nice 1. thanks for your information. coz i still new on blogger. Can't find the above code in my blogger new contempo template. Please Help. 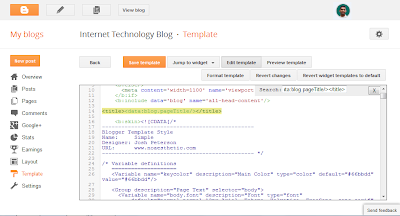 Blogspot shows the title tags in the correct way on the latest Blogger templates. So you do not need to change the code.